2. In an electric mixer or using a hand mixer, combine all the cake ingredients except the eggs and apples. Beat well. 3. Add eggs and beat well again. Stir in diced apples. 5. Bake for 60-65 minutes until a toothpick inserted comes out clean. Cool for about 10 minutes and then carefully remove from pan. Let cake cool a bit before adding glaze. 6. 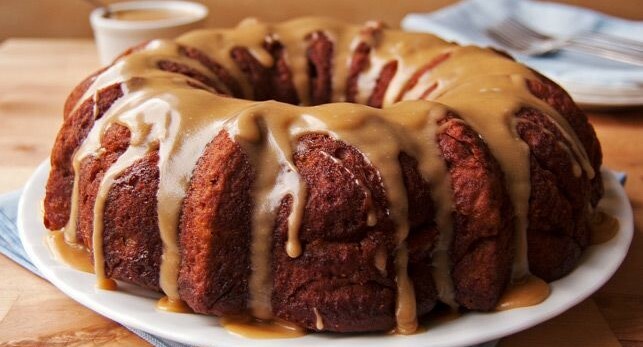 To make caramel glaze: In a small bowl, add all glaze ingredients. Mix together until completely smooth. Add a teaspoon or 2 of water, if necessary to make it smooth. Drizzle over cooled cake.